The scheme completely fails to take an unmissable opportunity to take full advantage of the site location, and in doing so will fail to allow the town centre to reach its full potential, and indeed does not maximise the rental value of the proposed retail. In otherwords, I object on the grounds that this scheme will fail to maximise the regeneration potential of the town, and in doing so represent an irreversible blight on that opportunity. A new tube service to Clapham High Street in Lambeth and Denmark Hill and Peckham in Southwark, due to the East London Line Phase 2, which is now a TfL commitment. 6 minutes direct rail connection to London Victoria. 8 minute direct rail connection to Waterloo. 25 minutes direct rail connection to Gatwick. 35 minutes direct rail connection to Heathrow T5, due to the new proposed Airtrack scheme, due to open 2015. 11 minutes direct rail connection to Shepherds Bush and Europes largest urban shopping mall (Westfield London). It is already ranked 37th in CACI’s Prime Location Rankings (Paddington being 32nd, Borough 38th), which is based upon a model that relates prime rent potential to accessibility of a location (contact Dan Parr at dparr@caci.co.uk for further information). The fundamental problem with the scheme is that it has been developed under a system of appraisal that has only looked at the values of office space as is currently available at Clapham Junction. With the availability of only sub-prime office stock, and inadequate levels of floorspace availability, the current market for office is severely under-shopped and under-valued. If the development were to seek to establish prime office units at this location, then the evaluation of these units, based upon the accessibility of the location, would be quite different. It would then work to set a new benchmark to enable further inward investment and development of office and workspace uses in the area, including land at LIDL and Boots. With such great accessibility to Central London, both airports, and the highly skilled and qualified workforce of South West London and Surrey, this location could easily attract a major international company as an occupier, lifting up the business profile of Wandsworth as a whole. Furthermore, the accessibility to Central London and the 2 main London airports, would make the location ideal for a hotel operator. Both hotel and office space is missing from the scheme; and therefore I object to the scheme on its potential to represent a severe missed opportunity to regenerate the area. More residential will do nothing to improve the area and provide little in the way of a much needed daytime economy for caterers, service providers, retailers and convenience stores in the area. Furthermore, without developing a stronger daytime population at this location the viability, of the whole retail scheme is at risk; considering the fact that the Westfield London is only 11 minutes away, and will only become more accessible as the London Overground service improves over time. Following our telephone conversation this morning, please find below my initial response to the application for 2 new station buildings, a new shopping centre and 2 residential towers. you were able to look into the issue of how we can ensure Paul’s replacement can secure the official status of our association prior to the 17th of November, and to schedule in an appropriate comittee meeting prior to that date, with if possible planning officers in attendance to talk us through the application, and receive our formal feedback. I should also identify myself as a regeneration and planning professional, with experience in both retail and housing market assessments. However, I do not have any vested interests for this site, other than from the perspective of being a resident in the area. Despite some efforts to clean the walls, remains an unnattractive environment for pedestrians. Considering the importance of the walk-in catchment to the new retail centre, I would like to be assured that improvements to this link are made; through, for example, pavement widening and the installation of ‘wall covers’ to hide the ugly and dirty sides of the walls below the railway bridge – similar to efforts made in places such as Waterloo. The applicant has provided a retail assessment, as required by PPS6, that demonstrates that the impacts of the retail development will be sustainable. I am also aware that the council have been preparing their own retail needs assessments for the borough, which probably confirm the need identified. However, PPS6 also identifies the important, complementary role of town centre strategies. My concern is that an important development such as this needs to be brought forward in the context of an overall town centre strategy; that ensures the performance and vitality of the town centre is maximised as a whole. My particular concern is the need for a strong leasing, management and public realm improvement strategy for St Johns Road. I would like to highlight a recent case in Derby, where the local authority failed to adequately plan for improving the rest of the town centre, in the context of the major extension to the Westfield Derby centre, leaving them to have to retrofit a strategy after the fact, with no related S106 funding support to do so from the applicant. On the other hand, I would like to direct you to the strategy work performed for Northampton Town Centre, which provides the council an overall ‘vision’ of how the town centre will improve, and what role the Grosvenor Extension will play. It sounds like you may have already put together the strands of a retail strategy for the town centre. In which case I would be keen to review it, and urge that effort is made to communicate this strategy to ensure that St Johns Road is able to develop, since without a strong St Johns Road, the overall performance of the centre, including the applicants ‘ interests, will be diminished. I was aware of a consultation process in regards to improvements to the main Clapham Junction road junction – it would be nice to see how these proposals fit in with an overall strategy to improve the retail environment in this area. My view would be securing S106 funds to help formulate and implement a stronger town centre strategy, which could include the need to create strategic town centre management roles, and establishment of a BID for St Johns Street would be highly beneficial. My immediate concern with the application is that I cannot locate a Housing Market and Impact Assessment in the application section of the website. proposed mix is what the current market is looking for. a. Insufficient S106, or allocation of land-use within the application will be allocated to improve upon the current provision of community facilities at Clapham Junction. I have a particular concern that this development will not only avoid the provision of additional affordable housing, but provide little to improve the quality of life of social housing tenants living in the Battersea Estates. These people will benefit least from the station building improvements, and suffer most from living in an area where property values are forever increasing, and developments that provide little in terms of providing them affordable leisure and community activities. For example, a residents association currently only receives £300 per year to cover the costs of their activities. It seems to me that the applicant could actually afford to do a lot for this area, with contributions to the surrounding estates, that would amount to a fraction of what they are spending on Station Buildings, which should receive more funding from Transport for London for such capital investment. Insufficiently affordable space in Clapham Junction also presents an issue for supporting more arts and creative industries in the area; essential for incubating independent trade and providing the context to create more cultural activity in the area. This would be important for creating a town centre with a point of difference to the new mall opening in White City. b. Insufficient consideration appears to have been made on the intended buyers of the new residential units. Will they be to buy-to-let investors or owner occupiers? From looking at the types of apartments for sale in Clapham Junction, and my own experience of researching into the market housing needs of those famous ‘Prosperous Professionals’, I am very concerned about the bias towards 1 bedroom flats and a lack of 3 bedroom units in the application. This is crucial, since the housing mix will determine the outcome of the type of resident that will live in the development, which will have a follow on impact on the type of community created. To put it plainly, if built with the buy-to-let market in mind, you will have a transient community of private renters, who play a weaker civic role in communities, whilst if it is owner-occupiers, you will have created a sustainable community with a stronger civic spirit. This is crucial to the governments agenda of place making. Considering the application at the Falcon Grove Job Centre for a hotel, I am surprised that the applicant for this scheme hasn’t also considered a hotel. Hotels would generate local jobs and could provide useful meeting and conference room facilities for the local economy. accessibility to the South East workforce. My immediate reaction to this application is that it is out of date; now that the housing bubble has burst, and that it is highly unlikely that government and the banks will permit the same lending conditions in the foreseeable future that supported the buy-to-let market, that this planning application seems to be hinged upon. My concern is that the application is the most major opportunity that Clapham Junction will ever receive to determine and define its identity. I for one think that this application seeks to just mirror the current identity as a place where people live to work elsewhere. This identity has negative impacts not only on the transport network (which will be exhasperated by this application), but on the sense of place of Clapham Junction, and a negative impact on the daytime economy of the centre. Considering the applicants desire for 42 storey towers, there does seem to be a woeful lost opportunity for real inward investment into the economy of Wandswortth. These could, if an office occupier was considered, become truly distinctive landmarks – a beacon for further gains in employment use in the area, rather than what the residential towers will signify. I would need to see the applicants or the councils reasoning for not bringing forward employment use. An analysis of current office vacancies is not enough, since a major new office development would enable the area to satisfy a demand from a major employer, who would not consider the office supply currently available in Clapham Junction. The amazing accessibility of the location (better than Victoria and Waterloo combined) and the availability of a ‘Prosperous Professional’ walk and bus-in catchment would clearly present a major opportunity for an employer, seeking to attract access to good employees. With the opening of White City in a few weeks time, Clapham Junction could really benefit from a development that not only helps to retain spend by improving the retail, but provides a greater number of town centre uses, to support the town centre economy. The lack of employment space at Clapham Junction, combined with a resident catchment who predominantly work in the city, means that the daytime economy of Clapham Junction suffers, and is much more vulnerable to the impacts of competing centres. I suspect that if the applicant were to re-appraise the market for the buy-to-let market, they might find that other uses, such as office and hotel, might well be more profitable for them. Considering the current collapse of house values going on in CJ at this very moment, I do see it being a wise move for the council to approve the application for the proposed residential units. An application for offices and employment use would be more favourable, as these would add to the values of existing residential properties, rather than detract from them. I think it will very important to develop this ‘Medical Centre’ to be much more than a proposal to blandly satisfy a planning requirement. It should be developed in a positive way that would form a civic hub for this new centre. My colleague James Lennon is presenting a talk on the role of ‘Polyclinics’ as kernels to regeneration activity at our Regeneration seminar in a couple of weeks time. It would be great if yourself and your colleagues could attend. Martin Linton sent me an email a few days ago about his recent actions regarding the case on tall buildings and his fight against the Clapham Junction redevelopment proposal. We will be particularly interested to hear the outcome from the Parliament debate on tower blocks in Battersea (following the recent failure of the Battersea Power Station proposal, a new plan has been unveiled: no skyscraper anymore and no building taller than Battersea Power station chimneys). BATTERSEA MP Martin Linton has called a debate next week in Parliament to discuss the issue of tall buildings. 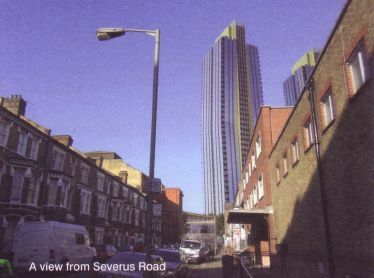 Martin is objecting to plans for super-size towers in Clapham Junction and in Wandsworth. The debate will happen on Wednesday 29th May, 4pm-4.30pm (Westminster Hall – Private Members’ Debate) and should be broadcast on BBC Parliament and/or parliamentlive.tv (but I have no experience on it) and minutes might be available here. Anyway we will report on it on this website as soon as we hear about the outcome, so keep an eye. Martin has won a public inquiry on Wandsworth’s controversial decision to approve two tower blocks-one of 32 storeys and one of 42- on Young’s brewery site in Wandsworth. Wandsworth Councillors voted in November to allow developers to build up to 42 storeys – twice as high as any tower block in the area. But Martin wrote to planning minister asking her to use her powers to ‘call in’ the development, overriding the Council’s decision and referring it to a public inquiry. In addition, stalls will be held in Northcote ward (corner of St John’s Road and Comyn Road) on Saturday 2nd and Saturday 9th May. Here is a link with his latest leaflet, talking about is objection to the current plan of buidling two 42-storey tower blocks. [From Cyril Richert: In a previous article, I commented the response sent by the developers to the Planning Officer regarding the proposed development in Clapham Junction station. In their letter, the developers said: “It is unfortunate that those objecting to the application have chosen to refer to only a small number of these images and indeed to publish their own deliberately distorted and misleading images“. Here is the response sent to the Planning Officer on behalf of the Clapham Junction Action Group. You can also refer to our article about their threat of legal action. Thank you for drawing to our attention the resubmitted application by Metro Shopping Fund and for your invitation to submit comments. It is noted that these comments are requested by 18th April 2009; however given that the application was re-submitted over a public holiday and the fact that many of our members have been experiencing problems accessing Wandsworth’s website for significant periods since then, we hope that you will understand that it will take several days or weeks to provide a full response. The application contains a large amount of new information albeit that the principal point of objection for the vast majority of local residents – the overwhelming height of the proposed towers – remains unchanged. We will therefore continue to study the new information and forward our comments as soon as we are able. First, we should like to point out that the images we have referred to most frequently are those contained in MSFs printed literature and posters, or circulated to the press as part of MSF’s publicity campaign. These show the towers cut off at around the 12th floor (posters displayed at Clapham Junction station), towers viewed from an elevated position against a striking purple sky (press photograph), and distant views from Northcote and Grant Roads (Copies of ‘The Beat’). These are, of course, the images that the developers themselves have selected to show us and which we strongly believe, for the various reasons we have discussed, to be grossly misrepresentative of the true appearance and scale of the proposed development. In addition, we have frequently referred to an image which is available only on MSF’s website and which shows one of the towers looming above the Falcon pub. This image has been produced from street level and is, we consider, one of the few images which appears accurately to represent the true impact of the development measurable against a recognisable local landmark. Again, this is MSF’s own image and it is disappointing that none exist from a slightly different angle which would have revealed both towers. It was for this reason that CJAG proposed in January 2009 to publish its own mock-up taking this image as a starting point and superimposing the second tower. This image was included in a draft of a leaflet which we proposed to distribute at that time, and was posted on our website for comment. Although the draft was available for around two weeks prior to the leaflet being printed, MSF chose to respond on the day before the proposed distribution by means of a lawyer’s letter threatening the members of CJAG with court action for malicious falsehood claiming damages and costs. This grossly disproportionate response simply highlights the bullying measures that MSF are prepared to take against local people exercising their rights to object, and the lengths to which they appear prepared to go to ensure that alternative representations of their proposals do not enter the public domain. For the record, we do not consider the image that we produced to be misrepresentative in any way. Indeed, because it showed both towers instead of just one, we consider it to be considerably more representative than MSF’s own image. However, under threat of legal action we were able to withdraw the image from publication and ensure that it was not used in the leaflet that we went ahead to distribute. The Council will be well aware that we have been campaigning for several months for a more meaningful consultation to be held which should, in our view, include the display of scale models within the station itself – not hidden away in the car park at times when the majority of people are unable to view them. MSF give these reasonable requests short shrift, considering that it is solely the Council’s duty to inform and consult. This overlooks the fact that scale models are available only from MSF and not from the Council, and that the Council is entitled to expect full support from a developer proposing so extensive a development which will impact on many thousands of people. The fact that MSF’s consultation has, by its own admission, reached only 1000 people (many of whom appear to have been passing through the station from locations as far a-field as Brighton and Liverpool) underlines the great concerns we hold that local people have been denied a proper debate. It is clear that almost everyone supports a redevelopment of Clapham Junction and particularly of the station which is well recognised as presenting and overcrowded and unpleasant environment. However, to suggest that these issues can only be resolved by means of the proposal submitted by MSF is manipulative in the extreme. The failings of Network Rail can be addressed in many other ways which do not involve the construction of two 42 storey tower blocks and the creation of 23,000m2 of retail space to compete with much loved local shops. Indeed, significant improvements are taking place already which are not mentioned in any of the distributed literature from MSF. In summary, therefore, we object most strongly to the assertion that our campaign has been selective and misleading – indeed we believe that local residents are being misled by information circulated by the developers themselves. We are advised that such matters are extremely serious and could influence the outcome of any future planning appeal.